Here's the quick synopsis: Tex Richman (Chris Cooper, over the top as usual), wants to drill under the delapidated muppet theater for oil, while Gary, Mary, and Walter set out to save the theatre, and with it, the fading, or as the movie would have us believe, already faded Muppet brand. The plan, and plot, involves finding the muppets, who have been split up for years. Kermit lives in his own mansion, depressed in Hollywood. Gonzo is a high class plumber at Gonzo's Royal Flush. Fozzie performs with a tribute band called The Moopets, and Miss Piggy is the plus-size fashion editor at Vogue Paris. How can we forget Animal, under treatment at a celebrity anger managment rehab center in Santa Barbara, and forbidden from doing his thing playing the drums. I'll save the rest of the story so as not to spoil your fun, but I will highlight the 6 tips the movie inspires for getting your entrepreneurial groove back, or even just affirming what you might have already learned in your business life. Never give up. OK, it may sound corny, but Kermit and the gang face all sorts of obstacles, and yet keep they keep going and forge ahead, once they make the decision to do so. For anyone who has ever tried and failed at something, most agree that it still feels good to have made the effort, and not be haunted by what if's for the rest of your life. Be clear on your mission, and repeat it a bit. The muppets understand that their mission is to educate and make people laugh, and use the world of puppets as a mirror for human challenges and emotions. They aren't shy about repeating this several times throughout the movie, so that the audience gets it. So, state your purpose and repeat it as much as you feel you need to. Or, as Miss Piggy would say: repetez, s'il vous plait. Decide if you'd be happier doing something else. The first hour of the movie finds the muppets in varying states of societal conformity in their "nonmuppet lives, which we take as a gentle dig at life the safe way. You might think you're happy in your career, until something irresistable comes your way. It may be worth making a move and changing your life. If that voice inside you keeps telling you to go for it, maybe you should. Brand for today, but maintain your core identity. The muppets enjoy some modern flourishes, including a computerized butler for Kermit, a "map travel" mode of transporting themselves to Paris (and back) in a few seconds, a Cee Lo inspired rendition of "Forget You" sung by the muppet chickens, and some not too shabby digital production special effects that no doubt Jim Henson would have thrilled at were he alive today. But at the end of the day, the muppets are simple and down to earth. They're about life and people, not cell phones and computers, although their social media presence rocks. ( see #5.) Their rise mirrored the seventees and eightees, when celebrity power meant the young Paul Simon and Steve Martin as guests, disco and techno music, bell bottoms and big hair. The movie acknowledges all of this, as if to say: you can't go forward unless you know where you've been. Do you know where your business has been, and how to move it forward? Rock your social media. When I read the recent Mashable blog post that highlighted the muppets on social media, I nearly fell out of my chair. Christina Warren writes: "The official Muppets Facebook page has more than 1.1 million fans and individual characters like Kermit, Miss Piggy, Gonzo and Animal have their own fan pages and campaigns. The Facebook pages have been well-utilized to spread informational and video content. 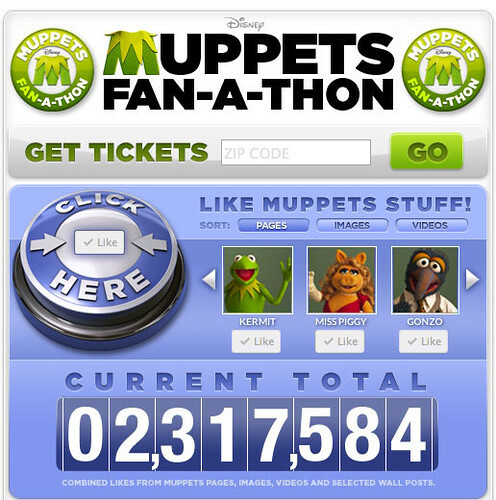 Disney also created The Muppets Fan-A-Thon on Facebook to entice fans to “Like” various characters, pages and videos in a bid to unlock advance screenings. Cheekily asking for “1 bazillion likes,” the campaign has yielded over 2 million Likes. since it started." There is also a Twitter campaign with 70,000 followers, not to mention Mobile apps, not to mention a Google + Chat featuring...who else? Kermit and Piggy. Of course for your business, you don't need to go wild, but you should be consistent with everything you do, and start slowly as you increase your online presence. Many think the advice to have a social media strategy is cliche, but it's true, you need stategy to manage your time and keep your branding consistent. 6. Find Your People. Much of the movie for me was about the power of people, whether it be groups, or partners, or even crowds to get you going. The film featured 2 extended dancing in the street sequences jolly enough to get even the most cynical among us tapping their feet. The muppets don't mean anything without Kermit. Kermit doesn't do so well without Piggy. Gary and Amy find their romantic way. So, who in your world is crucial to your success? Do you need a partner or a team? How can you grow your audience and your reach? See the movie anyway for the sheer joy of it, but be prepared for the business takeaway I walked away with: maybe life is a bit like Sesame Street after all. So, over to you. Did you see the movie and what did you think? Did it inspire you? What's your take on the Muppet social media buzz?